I recently spent a few days in the beautiful city of Loja, “cradle of art, literature, and music,” in the southern Andes of Ecuador. You know you are in a special place almost from the moment you arrive. Between the ornate castle-like structure of the City Gates, or the walking bridge displaying pipe organs, cellos, and guitars, it is clear that you are entering a city that appreciates music and culture. Loja is a city of about 200,000 in the Cuxibamba Valley, a few hours south of Cuenca and about an hour north of Vilcabamba. It borders the large Podocarpus National Park, which is a cloud forest and wildlife preserve. 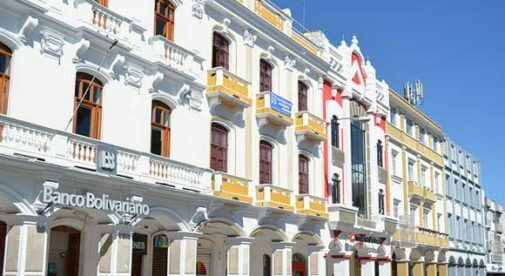 Loja is one of the oldest cities in Ecuador—over 500 years old—and the city center has a nice mix of historic buildings, parks, churches, monuments, and modern buildings. 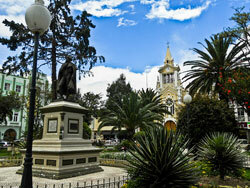 Sitting between 5,500 and 6,700 feet above sea level, Loja has some of the best weather to be found in Ecuador. During my short visit, days were in the upper 70s F, and the nights only about 10 degrees cooler. Residents I spoke with told me they rarely have days hotter than 85 F, or nights cooler than 70 F.
Loja is a great location if you would like to get immersed in the Ecuadorian lifestyle, rather than be part of an expat community. I did meet a few expats as I walked around town and sampled the many interesting restaurants, but Bostonian-native-turned-real estate agent, Darnell Dunn, reckons there are no more than two-dozen North Americans living in Loja. Darnell also took the time to show me some of the properties available. You can rent a modern, 1,000-square-foot, two-bedroom, one-bathroom apartment for $350 a month. This particular apartment came with a garage as well, but it is so close to town, a car is really not needed. You can also take advantage of the bus system (30 cents a ride), or take a cab anywhere in town for less than $5. If your budget can take $450 a month, how about a three-bedroom, two-bathroom condo with top-notch furnishings, bamboo floors, LED lighting, a video intercom system, kitchen with granite counter tops, oven, stove and a gas line, underground parking, a storage bodega, and more? With its great weather and friendly locals, Loja is the perfect place for expats to immerse themselves in the Ecuadorian lifestyle. With Loja’s climate, you don’t have the expense of a heating or cooling system. Loja is big enough to have a Supermaxi and other larger shopping options, but I also found no less than three large, indoor mercados with all of the produce, dried goods (like beans and rice), fruits, fish, meat, and flowers you can imagine at low prices. Even restaurant prices are not what you would expect in a city. My wife Rita and I enjoyed a wonderful meal in a downtown trattoria. Rita had a pizza, I had a Bourbon-glazed rib plate where the meat just melted off the bone. We also splurged, and each had a cold cerveza (beer), which ran our bill all the way up to $13.50. We also sampled the menu at a rather posh Ecuadorian grill restaurant twice, and both times got change back from our $20 bill. I found that the City of Music was also the city of smiles. People walking into restaurants or shops greeted those already inside, and said goodbye when leaving. And for an area that sees few gringos, people were remarkably patient with our beginner’s Spanish…although one waitress couldn’t help giggling when she corrected my attempt to order “una jarra de lemonad.” I pronounced the “j”, and of course I should have said “harra”. In general, the Ecuadorians in this region speak a little more slowly, and enunciate a little more clearly, which is a big help. Also, since Loja is home to a technical school and several colleges, it is not unusual to run into bilingual residents. Loja is a place I would definitely like to come back to and get to know a little better. And I still have to visit several museums—especially the Music Museum. For now, what I can say for sure is that $350 a month to live in the City of Music? That’s music to my ears!